KARE lovers get excited and ready, because our sales season is still on and it constantly keeps dropping prices!!! We promise quality with a hint of unique and irreplaceable! KARE has been surprising its fans worldwide with an incomparable and inexhaustible variety of new furniture, lighting and furnishing accessories, all expressing an intense passion for design. Are you looking for a comfy sofa or a stunning floor lamp to match your living room? KARE has the solution in this not-to-be-missed super SALES edition! Visit us this weekend 23-24 of February, exclusively in Nicosia SHOWROOM for two days ONLY! Make a list of your favorite products and make them yours this weekend save up to 50% off. You will most definitely discover even more! 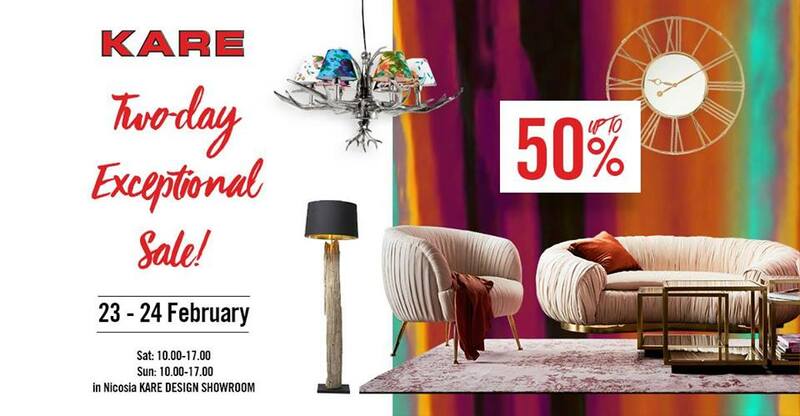 The KARE Exceptional Sale, offers a stunning array of furniture ready to turn your house into a home. Make sure you check it out!